DC Rebirth is DC Comics most recent reboot of the entire DC Universe that re-imagines many of the most iconic heroes and villains in a stunning, new light! This exciting interpretation of the DC Universe includes new iterations of the usual suspects from the Justice League, JSA, and Teen Titans as well as new and exciting themes like Deathstroke's Defiance, Justice League China, and the Dark Trinity of Bizarro, Red Hood, and Artemis! Long-time HeroClix fans will be ecstatic to see many never-before-clixed characters like Power Girl, The Signal, Colonel Poison, Bumblebee, Cyclone, Commander Steel, Shade the Changing Girl, Jessica Cruz, and Flex Mentallo alongside their favorite, iconic characters! 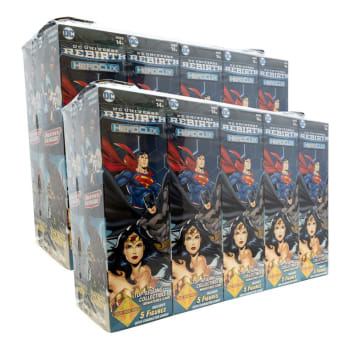 Much like when readers saw the DC Rebirth comics for the first time were sure there are going to be some BIG surprises as they open these boosters!